Here are some fresh and spicy jalapeno peppers that will make of your salsa a delight. If you need tomatillos these have a very good flavor and they will arraive fresh to your house. You can also prepare this salsa in molcajete. This is a salsa that you have to prepare, you have to try and you have to experience to feel the true flavor of the authentic Mexican food. – The seasoning of this salsa identifies perfectly well the Mexican cuisine with its flavors that are spicy, fresh, sour and a slight sweetness . All this in the same salsa. 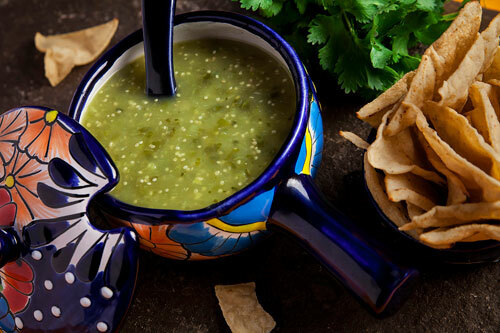 The green salsa is a salsa that is present on all the tables where typical Mexican food is served – it is like the salt and pepper of the Mexicans. What the Mexicans do is add it on their dishes to give them more flavor, it also makes the food not to taste as dry. Although this is not the only function of the salsa it is also used to cook dishes like the enchiladas , chilaquiles , pork ribs in green salsa , divorced eggs, pork rinds in green salsa, etc. This salsa is perfect for beginners because only some ingredients have to be cooked and then blend everything – that easy. The green salsa has tomatillos. When you buy them select the ones that are greener and harder, this indicates that they are ripe. The recipe is given with 1 jalapeno pepper however if you want a spicier salsa more jalapeno peppers can be used – under your own risk. This recipe yields 2 cups of salsa. Mix very well the green salsa with a mixing spatula. Suggestions: Try this salsa with tortilla chips or accompanying some delicious squash blossom quesadillas. Variation: If you want the green salsa to be fresher, transform it into green salsa with avocado. Did you like the Green Salsa?